We count on the fact that, basically, a parish or Congregational school is a Christian community which lives and celebrates the life of faith. For that reason, it must be an evangelizing community and a center of apostleship in all its branches, in its educational plan, in its rules, in its activities and in the people who are involved. Pastoral ministry in the school must encompass, with balance and complementarity, the three focus points of a Christian community of faith: evangelization, celebration and mission. 4. promote an environment which favors the testimony and evangelical action of the believers and guides them towards the insertion into and commitment to ecclesial movements and services. 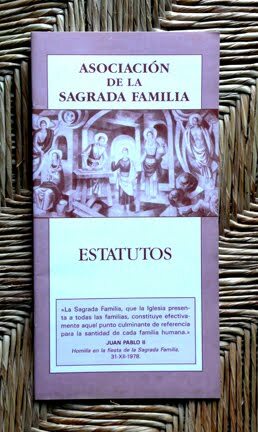 “The most genuine aspect of the Manyanetian pedagogy is its familial inspiration and its proposal of the Holy Family of Nazareth as ‘the absolute model of perfection’ in our centers or other places for all families. This pedagogy is sustained by a spirituality which totally permeates all the endeavors and elements which compose the educative endeavor. This spirituality gives birth to a peculiar way to educate” (Fr. Josep Roca). a. Formative centers where the culture of the heart and intelligence of our students (education in values) is the foundation of our educational task. b. Evangelizing communities which present the gospel as an option of life and commitment, in constant reference to religious formation following the example of Jesus, Mary and Joseph. c. Generous homes where it is possible to live in the richest of family relationships, thanks to mutual respect and acceptance, relationships based on trust and dialogue, in co-responsibility, joy and harmony among all. d. Open to all families without making distinctions. We value pastoral ministry in our schools as one of the main axes which maintains the entire educational task. For that reason, it must be well planned and integrated into school life and acknowledged by the education community. As much as it is possible and as a sign of ecclesial communion, we develop our educational ministry in collaboration with the local church and through the parishes. We are open to the human, social and religious inquiries of teachers, families and students through pastoral activities, ongoing formation activities, relationships with local, parochial and diocesan associations and movements, etc. We give priority to dialogue and personal relationships and provide spiritual direction in our schools, as means of orientation and personal companionship. We encourage school and extra-curricular activities that promote education during leisure time and that awaken inquiries which deepen one’s Christian formation and commitment. Because we educate the student in the Specific Character of the Manyanetian Schools from the perspective of being formed for a future family, we work on the formation of conscience, education for love, affections, sexuality, through appropriate pedagogic resources, with an age-appropriate program, keeping in mind the process of human growth and maturity of the students. Education regarding these aspects of life is an effective resource in guiding youth towards their personal realization of marriage and family life. Ministry for vocation is a priority in the educational task. I. The religious community: encourages, energizes and coordinates the pastoral action in the school with its word, action and testimony. II. 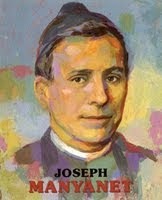 Teachers: As collaborators and leaders of the educational action that stems from the Specific Character of the Manyanetian Schools, they are—in the words of Saint Joseph Manyanet—“followers in the mission of Jesus.” To them is entrusted the incarnation of the Nazarean-family spirit and the promotion of a “culture of the heart and the mind,” so that students reach a harmonic synthesis of faith, culture and life. III. Mothers and Fathers: They are the first ones responsible for the education of their children and bearers of a priestly mission within the family. They take part in the pastoral action of the school with their testimony and by backing the school’s initiatives. IV. Students: They participate in the pastoral action of the school by proposing and backing diverse initiatives and, at the same time, collaborating with their parents and relatives and with the younger students, in the implementation of the diverse liturgical, religious, cultural and social events. V. Administration and other personnel: As members of the educational community, they give testimony to and support the educational guidelines of the school. The person responsible for the pastoral action in each school is the principal. The Pastoral delegate encourages the pastoral action with the collaboration of the Pastoral Department or Commission. The Pastoral delegate also executes the pastoral plan, being the liaison between the Pastoral Department of the Delegation and, if necessary, the respective parish. I. The students: The students are the first and main addressees of evangelization. The schools encourage their personal growth in faith—received within the family—according to the natural process of human and intellectual growth, promote their integration within the culture and life, and guide them towards a personal commitment. II. The families: Our pastoral action is addressed ultimately to families. The values that we propose to them are the values of the Holy Family of Nazareth. Our pastoral action helps them discover the spirituality of Nazareth and incarnate it in their lives. Families find a model, support and encouragement in the Manyanetian schools, not only to live out their vocation as Christian families but also to find a call to be apostles with and for other families. All school activities—such as the School-Family Project and the School of Parents—must be addressed to enliven, value and promote the mission of the family to evangelize. III. The teachers: The teachers are the direct collaborators in our educational and pastoral action. Through dialogue and living together, ongoing formation, pedagogic activities and school celebrations, they are invited and encouraged to renew the experience of their faith, to grow deeper in its content, to give testimony and to collaborate in the diverse pastoral activities. They receive formation about the spirituality of the Holy Family and the charism of Saint Joseph Manyanet through cursillos, workshops, conferen-ces, retreats, etc. IV. The other people who participate in the life of the school also receive the same Nazareth influence of the school and give a valuable contribution with their testimony. a. Moments of formation: At the very beginning of the day, there is a time for prayer and reflection. b. Religion Class: Undertaken with great care and pedagogic efficiency not different from that given the other subjects. c. Living together or Days of Reflection: their main goal is to promote reflection, enlightened by the gospel, about the meaning of life, along with personal and group testimony. d. Personal interview: the student has a value of his or her own. Counseling must be offered to students to help them find solutions to their personal and spiritual questions. This requires that people, time and appropriate spaces are made available. e. Formation for teachers recently hired about the Specific Character of the Manyanetian Schools. It is very important that new teachers accept and assume the main traits of our educational style from the very beginning. The person responsible for their formation will be the academic director, who can count on the participation of other teachers. f. Ongoing formation of lay collaborators: Days of Reflection will be arranged for the teachers, schools for parents, religious formation for teachers and parents, etc. a. Celebrations during the liturgical year: through announcements, celebration and activities, the main dimensions of the Christian mystery are developed, taking into account the various ages and circumstances of the students. b. Feasts and events related to the Specific Character of the Manyanetian Schools: we give special importance—festive, religious, pedagogic—to our own feasts: feast of Saint Joseph Manyanet, feast of the Holy Family, weeks for the family, feast of Saint Joseph, etc. c. Special occasions for prayer: according to the events, days or circumstances which encourage encounter with God through prayers, thanksgiving or intercessions. d. The Eucharist: summit of our communion and celebrations of the whole Christian community. In our schools these encounters with the mystery of Christ, Savior and teacher, take place in the midst of a familial and friendly environment. Each school will plan eucharistic celebrations throughout the school year, within and outside of the school schedule, such as the Mass for children, for youth, for families, etc. e. Penitential celebrations: these will be celebrated from the year when the children celebrate their first holy communion, preferably during Advent and Lent, so as to help them discover and value the Christian experience of forgiveness and God’s mercy and in order to build up the conscience of the child or youth. a. Vocational ministry: follows the initiatives of each school and the possible candidates. b. Solidarity campaigns: Each school will plan campaigns to collect clothing, food and other items, in order to teach our students to share with those who are living in difficult situations or in poverty. Special importance is given to the campaign “Manyanet Solidarity,” which provides help to different cultures in need, in the spirit of Saint Joseph Manyanet. c. Youth groups and movements: orien-ted towards reflection and to growing in our Christian life and other activities, such as the Manyanet Volunteers, Scouting groups, hiking, education for the good use of free time..., all of them helping the person to grow, inspired by the spirit of Saint Joseph Manyanet. d. Collaboration in ecclesial collections: Campaign for Human Development, Catholic Charities, etc. are occasions to show and express our involvement in the missionary action of the Church through prayer and financial aid. Religious formation must be considered one of the essential traits of the educational proposal of Christian schools. Living in a pluralistic society regarding religious options, though we define ourselves as a Christian school, we respect other religious expressions and sensitivities and we encourage mutual respect for the consciences of all people. This pluralistic reality of our society becomes a challenge for us, because we are called “to be prepared to give the reason for the hope that we have” (1 Peter 3:15). Religious formation classes are coordinated by the director, who works collaboratively with the Pastoral Department. This department plans periodic meetings with all the teachers working in this area to assure unity and continuity in the themes that are taught and examines and evaluates its development as well. It is also the responsibility of the Pastoral Department to make available the resources and means needed so the teachers of religion can pursue their tasks. Each school must have a Pastoral Department, which encourages and coordinates the pastoral ministry in its different expressions. Members of the department must have the appropriate skills and must represent all the sectors of the educational community. The coordinator of this department is the Pastoral Delegate, preferably a religious priest, with a specific preparation and dedication. He is responsible for undertaking the pastoral activities of the school, in conjunction with the principal and the principal team, as well as with the teachers. The pastoral delegate is part of the school board. The System of Rules and By-laws should have a description of his functions. The Pastoral Department counts on a specific budget for its programs and activities. As frequently as each Delegation considers appropriate, there will be a conference among the members of the different Pastoral councils, in order to exchange ideas, initiatives and plans and to evaluate goals and objectives.